This post will guide you how to use Excel FIXED function with syntax and examples in Microsoft excel. 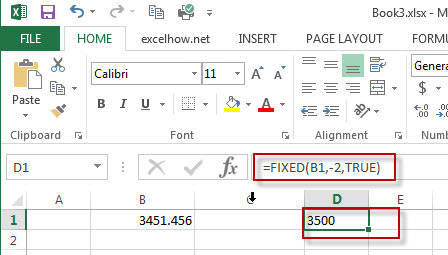 The Excel FIXED function rounds a number to the specified number of decimal places and returns the result as text string. 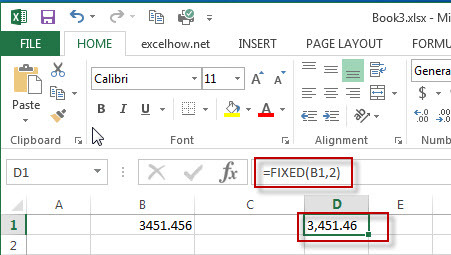 The FIXED function is a build-in function in Microsoft Excel and it is categorized as a Text Function. The FIXED function is available in Excel 2016, Excel 2013, Excel 2010, Excel 2007, Excel 2003, Excel XP, Excel 2000, Excel 2011 for Mac. number -This is a required argument. The number to be rounded and converted into text string. Decimals-This is an optional argument. It will specify the number of decimal places to be displayed after decimal point. Note: If Decimals value is omitted, it is set to be 2 by default. If Decimals value is negative, the number is rounded to the left of the decimal point. 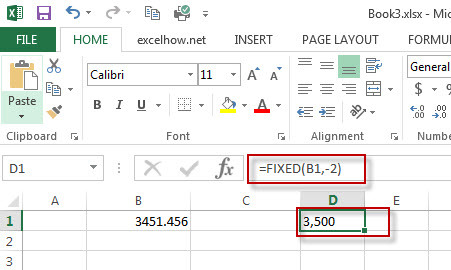 The below examples will show you how to use Excel FIXED Text function to round a number to the specified number of decimal places. #1 To round the number in B1 cell two digit to the right of the decimal point, just using FIXED(B1,2) formulas. #2 To round the number in B2 cell two digit to the left of the decimal point, just using FIXED(B1,-2) formulas. #3 To round the number in B3 cell two digit to the left of the decimal point without commas, just using FIXED(B1,-2,TRUE) formulas.